When it comes to your PPE spend, you may not realize that hand protection is costing you a lot more than you think. Take a moment to consider how many glove styles you currently have in use at your facility. Now think about how long those gloves actually last, and how often they’re being replaced or swapped out. Is the number higher than you thought? Most likely – and here’s why. Unfortunately for many of us, the procurement of PPE and life safety equipment ends up boiling down to price. It’s easy to be tempted by cheaper products when we’re always trying to reduce that bottom line, but we’re not doing ourselves any favours. Inexpensive products generally end up costing your business more money over time. Using inadequate (or plain old incorrect) PPE increases workers’ risk for injury, which is a huge deal when the average lost-time injury costs about $7500 per incident. When the price difference between a cheap cotton or leather glove and something made out of Kevlar or Dyneema is only a few dollars per pair, preventing a single hand injury can pay for a couple thousand pairs of cut-resistant gloves! It’s simple math, so be sure your purchasing department is looking at the bigger overall picture. How many styles of glove are currently being worn in your facility? By simply reducing the number of glove types worn by your workers can help to increase safety awareness, make training easier, reduce your lead times, minimize storage requirements, and eliminate duplicate products! Just by investing a few higher-quality, durable styles of gloves, your workers will know exactly which pair is worn for what kind of work, making them more likely to comply with PPE regulations and requirements – and, you’ll have to replace your gloves less often. Don’t worry. Even if you’re making some of the common hand protection mistakes mentioned above, there’s an easy solution. 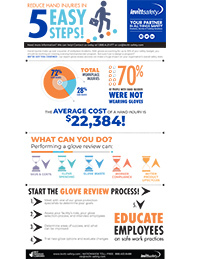 Glove reviews can help reduce hand injuries and lower costs by ensuring you’re using the right gloves. We’ll bring a skilled glove expert to your facility to look at your hand protection program, identify workplace hazards, and highlight any areas of improvement – and the best part? It’s free. Ready to Reduce Hand Injuries and Save Money? Get in touch with us today to start saving money and reducing hand injuries by booking your free glove review today. One of our hand protection specialists will be in touch with you soon! And if you’re interested in other ways to reduce hand injuries in your workplace, sign up for our free webinar on how to choose the right disposable gloves.